How Important are the Existing FTAs? The EU currently has Free Trade Agreements with over 60 countries. Rolling over these FTAs will need to be done by March 2019 as their application to the UK lapses as the UK leaves the EU. Grandfathering existing EU Free Trade Agreements is unlikely to happen without some engagement or negotiation with the EU. Hence what you might think is a bilateral issue between the UK and a given Free Trade Agreement (FTA) partner, becomes a trilateral issue which also involves the EU. Grandfathering may be hard to achieve because of Rules of Origin, clauses tied to services sectors and investment flows contained in the trade agreements the EU already has in some of the existing FTA, and because of issues to do with mutual recognition and tariff-rate quotas. Grandfathering may also be hard to achieve because either the UK or the FTA partners may seek further changes. Some FTA partners may feel that they are in a stronger negotiating position prior to March 2019, in comparison to during the transition period and they may choose to extract concessions now. Impacts arising from rules of origin constraints can be alleviated by agreeing to diagonal cumulation with the partner countries and the EU, and can help to minimise the impact on UK firms and businesses. But it does not mean that trade will be on the same basis as is currently the case. It is well known that the EU can be quite difficult in agreeing to diagonal cumulation. There are two alternative ways of addressing the problem which we would urge the UK government to consider in its negotiations with the EU: By only needing RoOs where MFN external tariff differ or by applying the ‘preferential partner’ principle. Existing clauses on services and investment in agreements such as EU-Korea, EU-Canada and EU-CARIFORUM are likely to have an impact on what both the UK and the EU are prepared to agree to in any future UK-EU agreement. With regard to mutual recognition of both conformity assessment and standards, the UK government should recognize the limits to its ability to having an independent regulatory policy and while retaining mutual recognition arrangements with the EU. Even if the existing free trade agreements can be grandfathered, producers and consumers in the UK, in the EU and in the FTA partner countries will be affected. Cutting and pasting the agreements cannot simply maintain the status quo. On leaving the EU the UK is also required to leave all the 37 Free Trade Agreements (FTAs) the EU currently has with more than 60 countries in the world. The government has made it clear that their intention is to roll these agreements over (also known as grandfathering) so that they will continue to apply to the UK, and so that trade would continue on the same basis as previously. Grandfathering these FTAs will require the agreement of the FTA partner countries, and the government has indicated that all existing countries have expressed a willingness to do so. The aim of this Briefing Paper is to outline why it may not be so easy to get agreement on grandfathering with the FTA partner countries, and why even if agreement could be reached it is unlikely that trade would continue on the same basis as previously. A key point which emerges from this discussion is that with regard to several key issues – Rules of Origin (RoOs), Most Favoured Nation (MFN) clauses, mutual recognition, and tariff-rate quotas – grandfathering the agreements is unlikely to happen without some engagement or negotiation with the EU. Hence what you might think is a bilateral issue between the UK and a given FTA partner, becomes a trilateral issue which also involves the EU. We first summarise the importance of the existing FTAs for the UK; then move on to a brief discussion of the technical and negotiating feasibility of rolling over; before moving on to the substantive part of the paper which outlines the trilateral dimensions to grandfathering and why -even if the agreements could be grandfathered – trade is likely to be impacted. There are several reasons why the existing FTAs might ‘matter’ for the UK. The most obvious reason is that they may matter economically. Trade statistics show that between 15%-17% of UK trade in goods is with these countries, and because these are Free Trade Agreements currently most of that trade takes place without tariffs being imposed. 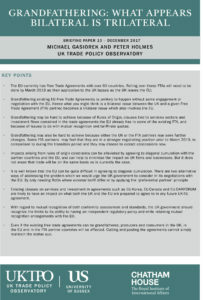 See below for a more detailed discussion of some descriptive statistics on the importance of the FTAs for the UK, and also on the importance of the UK for the FTA partner countries. Both of these aspects will matter in considering the feasibility of rolling the agreements over. Out of the 67 FTA countries, 4 of them are Least Developed Countries, and an additional 46 are classified by the UN as developing countries. The UK government has stated its desire to be able to pursue an independent trade policy with regard to developing countries which is development friendly. The way the existing FTAs are grandfathered or negotiated is likely to constitute an important part of that policy. Finally, in a broader context the UK is keen to negotiate new Free Trade Agreements with new partners. As has been much discussed negotiating trade agreements can be complex and take several years. Being able to renegotiate or grandfather existing agreements would provide the UK with more negotiating experience and may also demonstrate the UK’s negotiating ability to third country partners. As mentioned earlier around 15% of UK trade in goods is with EU FTA partner countries, with the precise figure varying a little across years and on whether one considers imports or exports. The share of FTA partners in UK services trade is slightly lower, although the data is less complete and only captures the cross-border flow of services, and hence omits commercial presence abroad (FDI) which can be substantial. Nevertheless, the share of services exports going to the EU FTA partner countries is around 12% and import shares are a bit lower at around 8-9%. It is also worth noting that most the FTAs, except for the European Economic Area countries, EU-Korea and EU-Canada, and the Deep and Comprehensive Free Trade Agreements (DCFTAs) with Ukraine, Moldova and Georgia, focus on the liberalisation of trade in goods. The agreements with the EEA countries have the greatest liberalisation of trade in services by virtue of involving Single Market access. The DCFTAs allow for services and investment liberalisation concomitant with the partner countries applying the relevant parts of the EU acquis domestically. Other than these, the EU-Korea, EU-Canada and the forthcoming EU-Japan agreement are seen as having the most comprehensive services and investment liberalisation agreements with third country partners. 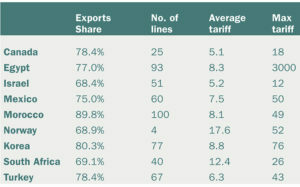 The top 10 FTA partner countries for trade in goods are given in Chart 1, which is based on the top export shares. There are several important features which emerge from this table. The first is that any individual countries’ share is typically very low – all countries except for Switzerland account for less than 2% of UK exports; and all countries other than Switzerland and Canada account for less than 2% of UK imports; over 60 of the partner countries have import and export shares of less than 1%. Secondly, while Switzerland accounts for the highest share of UK imports and exports, it is important to note that goods trade with Switzerland is highly specialised, with around 70% of the trade being in gold, jewellery and works of art. Services trade with Switzerland is also important as over 5% of UK exports services go to Switzerland and over 2.5% of UK import come from Switzerland. Similarly, over 80% of UK imports from South Africa is in gold and jewellery, and nearly 90% of UK imports from Norway is mineral fuels. These sectors – gold, jewellery, and mineral fuels – have extremely low or zero tariffs, and hence even with no rolling over of any agreements, UK imports are not likely to be much affected. However, other than to Switzerland, UK exports are much more diversified, for example the top exports to both Norway and South Africa are machinery and vehicles. Table 1 is based on extremely disaggregated UK trade data and focuses on the top 100 products that the UK exports to each of the top 10 FTA partner countries. The first column of the table identifies the share of UK exports to that destination which these 100 products account for. The total number of possible products is more than 5000, but we can see that in each case, 100 products account for the majority of UK exports to each destination. The lowest share accounted for by 100 products is to South Africa (69.1%), and the highest share is to Morocco (89.9%). The second column counts the number of products (out of these 100 products exported to each destination) for which the FTA partner country has a positive Most Favoured Nation (MFN) tariff. Hence we see that for Norway there are only 4 products for which there is a positive MFN tariff, while for Morocco there are MFN tariffs on all 100 products. Currently, owing to the FTA arrangement the UK will have largely tariff free access to these countries. Hence this column gives an indication of how many of the top UK exports to each of these destinations may be subject to a tariff should the FTA not be grandfathered. The third and fourth columns then give the average MFN tariff and the maximum MFN tariff which each of the FTA partner countries levies, out of the products for which there is a positive MFN tariff. For example we see that there are 93 products which may be levied on UK exports to Egypt, and the average tariff across these products is 8.3%. 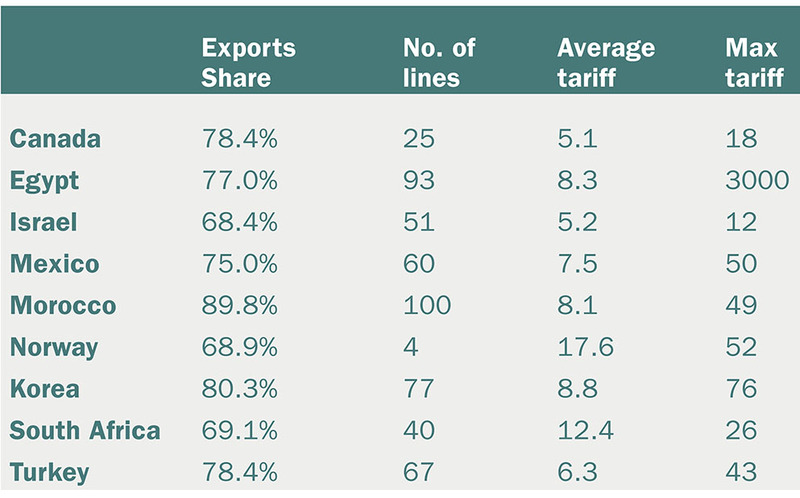 Table 1 indicates that the number of products that could be affected varies somewhat across the different FTA partners, but that the effects could be quite substantial, in particular with regard to exports to Egypt, Mexico, Morocco, Korea and Turkey. In a similar vein, it may be the case that access to FTA markets is important for specific industries either as an export destination or as a source of imports, some of which are likely to be intermediate inputs. For these industries maintaining access will be important. Consider Table 2. This aggregates the trade data into 16 industries and gives the total value of trade with the FTA partner countries for each industry, and the share of the FTA partners in the UK’s total trade for each industry. So in the bottom row we see that 15.7% of UK imports come from the FTA partners, and that 14.4% of UK exports go to the FTA partners. Not surprisingly this masks considerable differences across industries. For example, over 53% of imports of basic metals come from the FTA partners and just under 50% of UK exports go to the FTA partners. There are eight industries where the share of the FTA partners in UK imports is more than 50%, and there is one industry where this is the case for exports. In this section, we consider two aspects concerning the feasibility of the UK being able to grandfather the existing EU Free Trade Agreements. The first aspect concerns the legalities of the process and how it could be achieved even if all parties were willing. The second aspect concerns the willingness of the FTA partner countries to roll these agreements over, which in turn may depend on whether the grandfathering is intended for the transition period, or as a long-term permanent arrangement. (i) At one extreme it might be possible for there to be simply an exchange of letters between the UK and a given FTA partner agreeing that the scope of application of the existing agreement is extended to the UK for the transitional period. Whether this is feasible or not may depend on the countries involved and on whether there are any objections made at the WTO by third countries who feel that such an agreement, for example, either violates GATT article XXIV, or impacts on their access either to the UK or the EU. Either one of these preceding two outcomes is likely to apply, at least for the transition period. However, this will depend on the parties involved and on each given agreement. (iii) Negotiate a new agreement: Practically speaking, it seems impossible that this could happen prior to the transition period, so this outcome really only applies to the long-term establishment of relations with existing FTA partners. But, it is unclear if third parties would agree to have two rounds of negotiations, one for a transition period and another after the UK’s long-term relationship with the EU is agreed. It is also worth highlighting that trade agreements are typically very lengthy. By way of example, the EU-Korea agreement is 1432pages long, EU-Canada is 1088 pages, and EU-Ukraine is 2135 pages. And this is without considering the additional protocols and annexes such as those on Rules of Origin. This means that simply to be able to renegotiate these agreements will take a lot of careful exegetical analysis – which will be very time-consuming. b) Would the FTA Partners Agree? Negotiating trade agreements is complex, and to date they have been about liberalising market access. The negotiations with the EU are unique in that they involve countries negotiating over reducing market access. That has to happen because of the Brexit referendum decision, it does not have to happen with the FTA countries – so, on the face of it, it might seem reasonable to assume that the FTA partners would not wish barriers to increase, and so they would agree to roll-over the agreements. 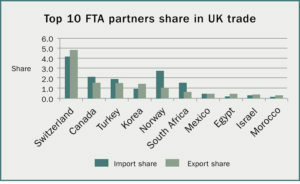 One way of considering this is to look at the relative importance of the UK for the trade of the FTA partner countries. 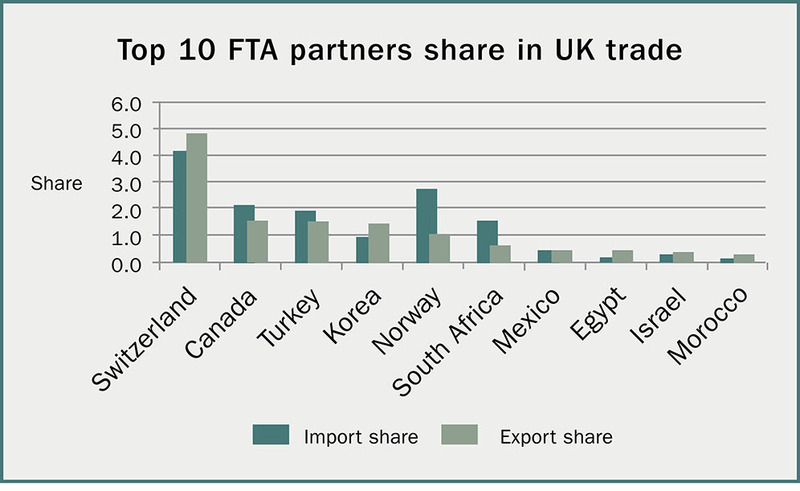 This can be seen in Chart 2, which gives the share of the UK in the same top 10 FTA partner countries’ imports and exports respectively. 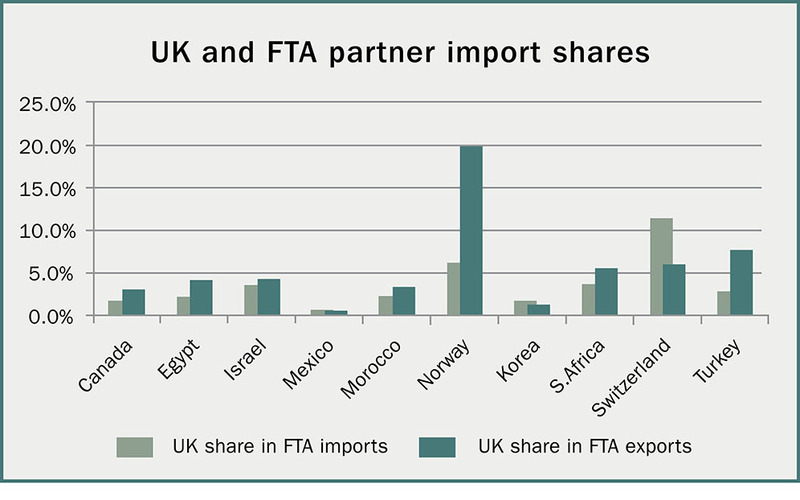 Comparing these numbers with those given earlier for the UK (Chart 1) we can see that in most cases the share of the UK in the FTA partner countries trade, is typically greater than the share of the FTA partners in the UK’s trade. Hence, proportionately it could be argued that trade with the UK is more important for the FTA partners, than conversely for the UK. This is important because it underlines that in principle these countries should be willing to continue to free trade with the UK. However, it is worth noting that for most countries the share of the UK in their trade is nevertheless still low, and additionally even though there may be ‘willingness’ to continue with free trade, that does not mean that grandfathering the agreements will not meet with any obstacles or attempts at revision. A lot depends on context here, and there are several reasons why there may be complications with FTA partner countries. First, clearly, the UK will want to and needs to establish the nature of its relationship with the existing FTA partner countries on a long-term basis. However, this will be more difficult to achieve without the partner countries knowing what form of trade agreement the UK has with the EU. For many products, this is because we are in a world of more complex supply chains and for many FTA countries, their exports to the EU may be indirect via the UK. For some agricultural products where tariff-rate quotas apply, changing access to the UK may impact on their access to EU markets. It is therefore likely that both the UK and the partner countries may seek to roll the agreements over on a temporary basis for the duration of the transition. In turn, that means that during the transition period the UK will need to renegotiate these agreements, or at a minimum, renegotiate the grandfathering, hence great-grandfathering the agreements. From the point of view of any given FTA partner (or group of partners), the country may feel that its negotiating strength is greater now, while there is greater uncertainty than will be the case during the transition period, and therefore greater pressure now on the UK to sign agreements. At a minimum, in order to agree to grandfathering, the FTA partner countries are likely to seek some assurance that the agreements will still apply post-transition, and that the UK will not seek at that stage further renegotiation. It is also worth noting that in order to increase their negotiating strength vis-à-vis the UK, countries may also choose to act together in wishing to address their renegotiating concerns with the UK, as opposed to acting individually. If a country feels access to the EU market has been or is likely to be impeded or diluted as a result of Brexit then it may wish to seek compensation. This may be driven as a result of any of the trilateral issues which we deal with more fully in the next section – Rules of Origin, MFN clauses, mutual recognition, and TRQs. For example, it may the case that wherever parts / intermediates are important then it may be more likely that the FTA partners are interested in access to the broader EU market, and how this may be affected by the UK leaving the EU. Where the UK is explicitly seeking to change arrangements, partner countries are likely to feel this impacts on their access to either or both of the UK or EU markets. For example, the UK has already made clear that with regard to fisheries policy it wishes to renegotiate the fishing quotas, basing them in the future on what is known as zonal attachment. Were this to be the case this could significantly impact on both the Norwegian and Icelandic fishing industries, and thus on their approach to future FTA discussions with the UK. If a country feels the balance of interests has shifted since the agreement was initially signed, then it may wish to redress this. In negotiating agreements, countries typically attempt to maximise access to foreign country markets, so they might see this as an opportunity to seek further market access in products which have not been fully liberalised in the existing FTA, or which have become more of a priority since the FTA was originally signed. This will vary from FTA to FTA; and may apply to goods (agriculture, textiles) and also to service sectors; eg. GATS mode 4. Similarly, countries may see this as an opportunity to increase protection in certain domestic sectors which have currently been liberalised. There are several reasons why grandfathering is likely to have trilateral dimensions. The four key issues which need to be considered here are the role of: Rules of Origin, MFN clauses, mutual recognition, and tariff rate quotas. To understand why Rules of Origin are likely to be an issue we first need to be clear about what they are, and why they are needed. Why we need them? Whenever countries offer each other preferential access, but each have a different policy on access for third countries, then the rules are needed to ensure that only those who are eligible get that preferential access. For example, suppose the EU and the UK sign a Free Trade Agreement between themselves, but the UK and the EU have different tariffs on imports from third countries -the EU tariff on imports from the US is 5% and the UK tariff on imports from the US is 10%. The UK wants to make sure that only goods which are made in the EU are being imported duty-free, and that the US is not exporting to the EU with a tariff of 5% and then exporting the good to the UK via the EU, with the zero tariff. Similarly, the EU would want to ensure that only goods which are made in the UK are exported to the EU duty-free, for those goods where the UK tariff on third countries is higher than the EU’s. Customs controls, typically at the border are therefore needed whenever countries levy different tariffs. This is why it is hard to conceive of there being no customs border between Northern Ireland and Ireland, should the UK leave the EU Customs Union. That, of course, raises the question of what constitutes a good ‘made’ in the UK, especially in today’s world of complex supply chains where goods are produced using inputs from many other countries. The rules that govern this are known as ‘Rules of Origin’ (RoOs). These can be specified in different ways but a common way is to specify that a minimum percentage, e.g. 40% of the value of the good contains domestic activity or value. Suppose a good sells for £100, the rule would then be that at least £40 of that should derive from UK economic activity. Why do they matter? While RoOs are needed in any free trade agreements, they potentially make it more difficult for firms to freely source intermediate inputs from non-preferential partner countries and retain tariff-free access with their preferential partners. With a 40% domestic value added rule, UK firms could import intermediates up to 60% of the value of the good. If the rule was a 70% domestic value added rule, then they could only import intermediates up to 30% of the value of the good. That makes it harder to source foreign intermediates. The current situation: From the preceding it should be clear that RoOs are only needed when the partner countries levy different tariffs on imports from third countries. As the EU is a customs union there is a common external tariff on imports from third countries which all EU countries apply. This means that currently on trade with the EU Rules of Origin are not needed. Because of this currently the UK has no restrictions on the amount of non-EU inputs that can be included in the production of any good – as long as the goods can be sold in the UK, they can be sold anywhere in the EU and no tariffs apply. If there is no trade deal with the EU or if there is an alternative Customs Union, then RoOs would not be needed in order to determine whether UK exports could get preferential access to the EU market, and there would no restrictions on the amount of non-EU inputs that could be used in UK exports to the EU. However, there might be restrictions to do with regulations and standards but that is a different issue related to the UK’s membership of the Single Market, which we discuss in more detail below. – In order to have tariff-free access into the EU market, producers would have to show that sufficient economic activity has taken place in the UK e.g. 40% domestic share of value added i.e. they have to prove the good originated in the UK. – There would therefore be restrictions on the amount of foreign intermediates that UK producers could use as inputs into goods exported to the EU, if they want tariff free access. – Suppose the UK and the EU signed a Free Trade Agreement in which the rule was that goods needed to have a minimum of 40% domestic value added to be considered as originating. Suppose the UK exported a good to the EU which were made up of 30% UK value added, 35% intermediates from the US, and 35% intermediate inputs from Korea. That good could not enter the EU duty free because there would be insufficient UK value added in it. – Even if the UK grandfathered the EU-Korea agreement this would still apply – because there is still insufficient UK value added in the good being exported to the EU. And of course the same could apply with regard to goods being exported by the EU to the UK. It is important to note that this could easily mean that, for example, a given intermediate input could be exported directly from Korea to the EU duty free, but if that input is used in the production of a UK good which is then exported to the EU, that input cannot count for UK originating status. The same could apply to UK exports of intermediates to the EU which are then used in EU exports to Korea; and EU exports of intermediates to the UK which are then used in UK exports to Korea. Hence bilateral flows between each of the three countries in this example (the UK, Korea and the EU) are likely be affected. Is Diagonal Cumulation a way Round this Problem? With diagonal cumulation all countries (in this example the UK, Korea and the EU) would have to agree that that intermediate inputs which could enter any of the partners duty free if exported directly, could be used by one of the other countries in their production and exports, and that the value of that input would count for originating purposes. This would mean that the UK could use Korean inputs, count the value of those inputs to see whether the good was “made in the UK”, and export to the EU duty-free if there was sufficient UK (+ Korean) value added. So in the example above, for originating purposes the UK now has 30% domestic value added + 35% intermediates from Korea = 65%. That is easily above the threshold of 40% and so the good can be exported to the EU duty-free. Note that for this to happen all countries need to agree to this. Not just the UK and Korea, but the EU as well. So what might have looked like a bilateral issue between the UK and Korea, is in fact trilateral as it involves the EU. Agreeing to diagonal cumulation can make a big difference and alleviate some of the constraints on the use of foreign intermediates, and thus help to minimise the impact on UK firms and businesses. However, while diagonal cumulation helps, it does not mean that trade will be on the same basis as is currently the case. At present, the UK is free to export a good to the EU with no restrictions on the value of imported intermediates from third countries. Even with diagonal cumulation there will still be a limit as to how much can be imported while retaining duty-free access to the EU market. An additional problem is that it is well known that the EU can be quite demanding in agreeing to diagonal cumulation. More specifically, it typically only agrees to this if ALL the countries involved (hence in the example above the EU, the UK and Korea) have Free Trade Agreements among themselves, and all apply the EU’s Rules of Origin. The Rules of Origin the EU likes to insist on – and has done so with the EEA countries, the Balkans, and the Southern Mediterranean partner countries are the Pan-European Mediterranean preferential Rules of Origin. Hence, in order for the UK to get diagonal cumulation it will probably have to agree to apply the Pan-European Mediterranean Rules of Origin but on political grounds, if nothing else, it may not wish to do so. 1. By only needing RoOs where external tariffs differ: As discussed earlier RoOs are only needed, where the UK and the EU decide to charge different tariffs on imports from third countries. The UK and the EU could agree that on products where their tariffs are the same (or higher) that RoOs need not apply. This does create additional procedural costs for firms who will need to prove they are only using inputs with tariffs which are the same or higher. However, firms will already be required to provide documentation with regard to the share of foreign intermediate input usage, and for many firms this should not be too difficult an additional administrative burden. 2. By applying the ‘preferential partner’ principle: Suppose (hypothetically) that in the EU-Korea FTA for a good to be considered Korean when exported to the EU there had to be a minimum of 40% Korean value added in the good. Suppose, however, that in a UK-Korea FTA for a good to be considered Korean there only had to be a minimum of 30% Korean value added. The EU would not want to offer standard diagonal cumulation because it means that the Korean input would only need to have 30% Korean value added when exported to the UK; and if it could be included for originating purposes in the UK’s exports to the EU then that good is obtaining easier access to the EU market then if it were exported directly. The solution is to agree that any preferential partner (e.g. the UK) can use the intermediate inputs of any other preferential partner (e.g. Korea), providing that for each intermediate input the RoO applicable to the country supplying the intermediate is used. Hence the UK, could use the Korean input in its exports to the EU providing that there was 40% Korean value added in the input being imported and used. Given that the amount of Korean value added has to be provided in any case, in order for the UK exporter to obtain duty free access to the EU market, all this means is that where the Korean value added meets or exceeds that which the EU requires when importing the good directly, then cumulation can occur. The advantage of this proposal is that it is relatively straightforward to implement, and does not require all the partner countries (UK, EU and Korea) to have the same Rules of Origin. Indeed, it does not even require the UK and Korea to have a Free Trade Agreement. It should be possible for the UK to use Korean inputs and for these to count for originating purposes even if there was only an EU-Korea agreement, and a UK-EU agreement. With regard to the discussion in this section, what is unknown is the extent to which the issue of sourcing intermediates from third countries, or from FTA partner countries is likely to matter for UK firms and businesses. This will depend on the extent to which firms source intermediate inputs (both goods and services) from abroad, and from which countries. This is an issue where there is an urgent need for more analysis. Several of the EU Free trade agreements have agreements have ‘most-favoured nation’ (MFN) clauses with regard to both services and investment liberalisation. This applies notably in the EU-Korea, EU-Canada and EU-CARIFORUM agreements, as well, probably, as in the recently agreed EU-Japan agreement. For example, Article 7.8 of the EU-Korea agreement states: “each Party shall accord to services and service suppliers of the other Party treatment no less favourable than that it accords to like services and service suppliers of any third country in the context of an economic integration agreement signed after the entry into force of this Agreement”. There is a parallel clause with regard to investment and the right to establishment, and there are similar clauses in the EU-Canada and EU-CARIFORUM agreements. Essentially, these clauses state that if either party offers more favourable access to any other country (e.g. in a subsequent FTA), then they must offer that degree of access to the partner as well. Suppose the UK signs a deep and comprehensive FTA with the EU which covers services and investment and has also grandfathered the Korea and the Canada agreements. The UK may then be obliged to offer the same degree of access to Korea and Canada. Note that this does not only apply to the UK. In signing the agreement with the UK, the EU would then also have to offer any improved access to Korea and Canada. In addition, if the UK subsequently liberalised any further, or allowed for deeper liberalisation with any other FTA partner, either as part of the grandfathering process, or in negotiating a new trade agreement, for example with Australia or the US, then again, these MFN clauses would apply. In turn, this trilateral dimension is likely to have implications for how much each party is willing to negotiate and the timing of those negotiations. For the UK, if it first rolls over the Korea, Canada and CARIFORUM agreements and then signs a Free Trade Agreement with the EU which offers a greater degree of liberalisation –it would have to also offer this to Korea, Canada and the CARIFORUM countries. However, if it first signed the agreement with the EU, and only subsequently rolled over the other agreements, then the matching offers to Korea, Canada and CARIFORUM would not have to be made. For the EU, as the agreements with Korea, Canada and with CARIFORUM are already signed and in place – so if it does agree greater liberalisation with the UK then it would have to offer the same to the other partners. This may be a constraint in the negotiations as it may limit the liberalisation the EU is prepared to offer the UK. Both the EU-Korea and the EU-Canada agreements do have an opt-out clause with regard to the application of these MFN clauses. The opt-out applies where the new FTA being signed “stipulates a significantly higher level of obligations than those undertaken in the context of the EU-Korea or EU-Canada agreement. For example in the EU-Korea agreement, the annex defines ‘significantly higher’ to mean either the ‘creation of an internal market on services and establishment’, or where the agreement encompasses the right of establishment and the ‘alignment of the legislation of one or more of the parties to the regional economic integration agreement with the legislation of the other party or parties to that agreement’. This would therefore appear to mean that unless the UK and the EU agreed to continued single market access with regard to services or investment; or unless the UK agrees to align its legislation to that of the EU, then the MFN clauses would apply. From the perspective of the UK, given that both of the preceding options have been categorically ruled out by the UK government, it is highly likely that the MFN clauses would then be invoked. From the perspective of the EU, anything less than ‘alignment of the legislation’ by the UK results in the application of the MFN clause, hence if the UK is not prepared to accept full alignment, the EU may not be prepared to offer more than it has offered in the existing agreements. This is another clear example of what appears to be a bilateral issue – service and investment liberalisation or grandfathering between the UK and an FTA partner – potentially having substantial trilateral ramifications, as well as ramifications with regard to the timing and ordering of future negotiations. In discussing mutual recognition, it is important to distinguish between mutual recognition of conformity assessment, and mutual recognition of mandatory standards embodied in regulations. Mutual recognition of conformity assessment can in principle apply, even if partner countries have different standards, though this is rare. If two countries have a Mutual Recognition Agreement (MRA) covering conformity assessment, in order to sell to the other market producers have to meet the required standards for that market and produce evidence they have done so. If there is mutual recognition of the testing and certification arrangements inspections carried out in the exporter can be taken as proof that firms have conformed to the required importer standards. Hence, a good being exported from the UK to Canada must meet always meet Canadian mandatory standards, but an agreement on mutual recognition of conformity assessment would mean that all the UK firm had to provide was proof that the Canadian standards have been met in the production location and the good would not then need to be tested by the Canadian authorities or Canadian testing and certification laboratories. Hence, where there is mutual recognition of testing and certification, certificates issued either by the producers or testing labs in the exporting country are accepted by the importing country as proof of meeting the required standards. Mutual recognition of testing and certification means that exporters do not have their products stopped at customs borders and tested for conformity with importer country standards. Mutual recognition of conformity assessment in the EU’s Free Trade Agreements is currently quite limited other than in the European Economic Area (EEA). The UK, through the EU, currently has Mutual Recognition Agreements with the non-EU EEA countries (Norway, Liechtenstein and Iceland) and self-standing Conformity Assessment and Acceptance Agreements (ACAAs) with Australia, Canada, Japan, New Zealand, the USA, Israel and Switzerland. Only the EEA agreement is fully comprehensive. The EU-Korea FTA does include mutual recognition provisions of testing and certification for certain sectors (consumer electronics, vehicles). These pre-suppose that both parties use either Korean or EU mandatory standards. For example, if the UK grandfathered the EU-Korea agreement it would be agreeing to mutual recognition of conformity assessment for consumer electronics and to the alignment of UK domestic regulations to those used by the EU. The EU has made it clear in recent policy documents that in the future for it to sign mutual recognition agreements on conformity assessment with a third country such as the UK, that country has to adopt EU rules for all its domestic production not just exports to the EU. (European Commission The implementation of EU products rules 2016 (Text with EEA relevance) (2016/ OJ C 272/01)). This would appear to suggest that in order to agree to mutual recognition on conformity assessment the EU increasingly also demands full alignment of regulations. This implies that if the UK wanted to agree to a mutual recognition agreement with the EU, as part of a future Free Trade Agreement with the EU, it would also have to commit to EU regulations. This would apply in the context of new FTAs or in the context of grandfathering existing FTAs. The EU requirement (for mutual recognition) is that goods to be sold in the UK have to adhere to the standards that mean they could also be sold in the EU. Hence, free circulation requires both Mutual Recognition of mandatory standards and of conformity assessment. There is an alternative proposal associated with the Legatum Institute that the UK should not harmonise rules with the EU, but instead chooses to try and obtain mutual recognition with multiple countries. But mutual recognition only offers a way out with respect to mandatory standards and conformity assessment where all parties recognise one another’s rules. The UK could not recognise the validity of US food safety inspections on import goods and expect the EU to let goods of that type sold in the UK move freely into the EU unless the EU also recognised the safety of the US goods and the way they had been tested. In addition, it appears that the EU is concerned about the UK attempting to pursue a more lax regulatory route which may give it a supposed competitive advantage. The EEA Treaty suspends anti-dumping and CVDs only for sectors where the EU acquis is fully harmonised. The final important trilateral aspect is with regard to tariff-rate quotas (TRQs), which feature in many of the EU’s trade agreements. The issue here is that for a range of typically agricultural products, FTA partner countries have an allocated quota to the entire EU market, which of course includes the UK. In grandfathering any given agreement how this quota is to be (re)allocated between the UK and the EU market is likely to be a contentious issues and is directly a trilateral issue as it affects the UK, the FTA partner and the EU. Of course, the issue of TRQ’s does not only apply to the FTA partner countries but also to non-FTA partner countries such as Australia and New Zealand. It is already the case that this issue is proving contentious at the WTO, where the initial proposals put forward by the EU and the UK for dealing with the TRQs have met with opposition from certain countries who feel that the proposed solutions will impede their access to the EU market. Where existing FTA partner countries feel that their access to either the UK or the EU market will be negatively affected by the reallocation of quotas, they are less likely to agree to the rolling over of the agreements. However, as these quotas are EU wide, discussions will need to take place between the UK, the EU and the partner country / countries to achieve resolution. To maintain current trading opportunities, the UK needs to grandfather existing agreements, and it makes sense to focus on the ones that matter most economically, and those where the absence of an agreement is likely to either lead to the biggest overall economic impact, or to impact significantly on particular sectors. This requires looking at the extent of trade with each partner, the scope of the agreement, and the likely impact on barriers to trade in goods and services in the event of the agreement lapsing. It will be particularly important to examine the extent of sourcing of intermediate inputs by UK firms from different sources – the EU, the FTA partner countries and third countries, in order to better understand the magnitude of the Rules of Origin constraints. First, that grandfathering may be hard to achieve, and certainly much harder than the government appears to have suggested in its evidence to the House of Commons Select Committee on Trade. This is because FTA partners may seek further changes or concessions, and because of the trilateral issues raised in this briefing paper. Second, that even if the agreements can be grandfathered existing producers and consumers in the UK, in the EU and in the FTA partner countries, will be affected. Cutting and pasting the agreements cannot will not simply maintain the status quo. Third, that rolling over the agreements will need to be done by March 2019 as their application lapses as the UK leaves the EU; and that unless all agreements can be renegotiated by March 2019 -including the changes in RoOs needed to make business conditions the same – the government’s aim of a no change implementation period cannot be achieved. The more the UK government seeks to change the current terms under which it trades with the existing EU-FTA partners – be this with regard to tariff rate quotas and agriculture, or fisheries policy, the harder it will be to achieve a successful rollover. With regard to Rules of Origin, the government should seek to either agree to diagonal cumulation with the FTA partners and with the EU, and/or to apply the principle that Rules of Origin are only needed where intermediate inputs are used on goods where tariff rates differ and/or to apply the preferential partner principle. The existing MFN clauses in agreements such as EU-Korea, EU-Canada and EU-CARIFORUM will impact on the timing of negotiations over services and investment liberalization, and on the extent of liberalization between the EU and the UK. If the UK government wants to achieve maximum continued access to services and investment in the EU, this issue will need addressing urgently. Otherwise, the UK may be de facto forced to delay rolling over these agreements, or the services and investment elements of the agreements, while it is still negotiating with the EU. Michael Gasiorek and Peter Holmes assert their moral right to be identified as the authors of this publication. Readers are encouraged to reproduce material from UKTPO for their own publications, as long as they are not being sold commercially. As copyright holder, UKTPO requests due acknowledgement. For online use, we ask readers to link to the original resource on the UKTPO website. More specifically in his evidence to the International Trade Select Committee Liam Fox stated that the UK would not disadvantage current exporters to the UK by diminishing their market access, would not diminish UK producers by increasing that market access, and would not disadvantage UK consumers. Interestingly he did not appear to saying anything about disadvantaging UK exporters. In addition to Free Trade Agreements, there are a number of other international agreements which the UK is part of as a result of membership of the EU. One estimate is that there are 759 such treaties with 168 countries (Paul McLean, Financial Times, May 30 2017). In this paper we do not consider all these agreements but specifically focus on the EU’s Free Trade Agreements. We have included all FTAs which have been signed and at least provisionally implemented, including CETA. The analysis of trade flows in this paper was undertaken using the TradeSift software, and based on Comtrade data. Taking the top import shares yields the same countries except for the inclusion of Algeria and the dropping of Egypt. This is the tariff that would apply if there was no Free Trade Agreement, and trade was on what is often referred to as “WTO terms”. Data for Korea is for 2015. This is known as ‘trade deflection’. In most FTAs the Rules of Origin are specified for each product separately and often at the HS 6-digit level, which means for more than 5000 products. This is why the annexes covering Rules of Origin are very long. In the EU-Canada agreement the protocol is 229 pages. Rules of origin may still be needed if the “Customs Union” does not cover all goods or has an incomplete Common Commercial Policy, as in EU-Turkey.